Peanut Butter - Remembering Jesse Parker, Inc. When I returned to the United States after spending nearly three weeks in Uganda, I swore I would never forget the things I saw, the people I met, and the experiences I had. I came back empowered and ready to change the world on behalf of my new friends in Uganda. Yes, I would end poverty in Uganda – no wait – Africa. While I’m at it, I might as well wipe out poverty worldwide! This is the post-trip high, the feeling that you can and will do everything to change the world. It’s a wonderful feeling, but unfortunately, with time it fades until you’re left with a little spark of the enthusiasm you once had. It both startled and saddened me the first time I realized I had gone a whole day without thinking of Uganda. How could this be? The trip had such a huge impact on me, but nevertheless, I was falling back into life’s normal flow. I knew that the hustle and bustle of life was smoldering my fire. However, all is not lost, for spark can still burst into flames if nurtur ed. That’s where my idea for this blog comes in. I would like to do a series of posts in order to re-ignite my fire, and hopefully yours too. See, what I’ve found it this: the simplest things in my daily life (nail clippers, my chemistry textbook, a soccer ball) conjure up memories of Uganda. Each post in the blog will be titled with an everyday object that ties into an experience we had while in Uganda. I would like to share some of my stories with you both for your enjoyment and as a reminder to myself of what I felt while in Uganda. Maybe I can even convince some of my team members to share their perspectives. Through these reflections, I hope to reignite that feeling of invincibility that gives me the audacity to believe that I – no – WE can change the world. Let’s build a fire. For me, peanut butter is a staple food. I put it in my oatmeal for breakfast, dip my apples in it, and I have been known to eat it straight out of the jar. In fact, it’s a rare day that I go without peanut butter. Luckily for me, this protein-packed spread is found everywhere in the United States. Peanut butter is always available in my cafeteria at college, and when the cafeteria isn’t open, I have a two pound jar of it sitting on a shelf in my dorm room. Yes, peanut butter is an American favorite. For this reason, we decided to serve a breakfast of peanut butter and jelly sandwiches to the girls at St. Kizito’s boarding school in Uganda as a way to thank them for hosting us during our stay. This would be a real treat for the girls since the ingredients used to make PBJ sandwiches were too expensive for the average Ugandan family. 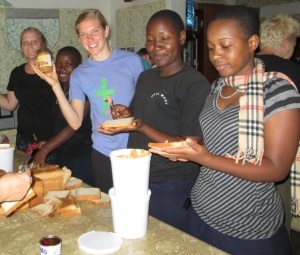 We knew that we could buy bread and jelly fairly easily once we were in Uganda, however the peanut butter would be harder to come by and much more expensive. It was agreed that it would be worth using up some of our valuable trunk space to transport peanut butter to Uganda. Once the word was out that we needed peanut butter, the donations rolled in. This was a common phenomenon in preparing for the trip. When we were looking for a specific item to bring to Uganda, people from all over reached out to give what they had. It was truly inspirational and proved that our trip to Uganda was a community effort. For me, the most touching donation came from one of my co-workers and friends. This man works hard for little pay, but takes pride in his work. While he trained me on the job, we often chatted about our lives. He talked about his upcoming fishing trip and his plans to fund it. I talked about my school year winding down and my anticipation for my travels this summer. Naturally, my trip to Uganda came up and he was genuinely interested in hearing about what we planned to do while we were there. I told him about the wells, the boarding schools, and the “American breakfast” of PBJ sandwiches. 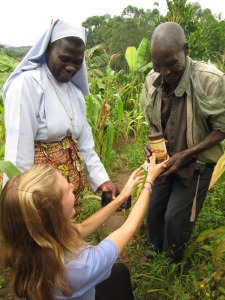 He was astonished that something as common as peanut butter was a rare treat in Uganda. The next week when I showed up for job training, my co-worker appeared with two jars of creamy peanut butter in tow. He gave them to me for our American breakfast in Uganda, but said if I didn’t have room for them in my luggage, I could use them at college. I was in awe. Here is a man who didn’t have much extra money, but so selflessly gave to people halfway around the world whom he will probably never meet. From that moment, I knew I was getting those two jars of peanut butter to Uganda. I kept track of these special jars of peanut butter over the course of packing, traveling, and unpacking in Uganda where they had arrived safe and sound. The first peanut butter jar was used to make PBJ sandwiches for the girls as part of our American breakfast (this is quite a story in and of itself, but I will save it for another time). As for the second jar of peanut butter, it would have a different fate. I had an idea. There was an older man in the village of Bbumbu that had owned the land we were building the well on. I had never met him, but I’d heard of his valiant deed of giving up a valuable plot of his farmland, and therefore a portion of his livelihood, for the new well. If anyone deserved this second jar of peanut butter, it was him. On our last full day in Uganda, we found him coming up through his corn field from the old, murky water hole that would soon be replaced by a new well. His feet were bare and calloused and he stood stooped over as if he was carrying a heavy canvas sack on his back, but his eyes were warm and framed with smile wrinkles. As is the custom in Uganda for saying thanks, I knelt down on the dirt path and presented him with peanut butter, a meager gift in return for all he gave on behalf of the well. His smile spread and he accepted the peanut butter with a mixture of joy and surprise. He said something to Sister Salome, who had been watching this exchange and she smiled.